TV presenter Matthew Wright has apologised for making jokes while discussing the first murder on the Western Isles in 43 years. During Tuesday's The Wright Stuff , he did a mock Scottish accent and said there's been another murder , copying a phrase from detective show Taggart. The murder of Liam Aitchison was discussed during a newspaper review. Panel member Charlie Baker described the probe as the longest episode of Taggart of all time . We are very disappointed at the insensitive and offensive nature of the comments made on the Channel 5 programme, The Wright Stuff. This is very upsetting and insulting for, not just the family, but for the whole community of the Western Isles. In his apology, Wright, who presents the Channel 5 morning discussion show, said it had not been his intention to belittle Liam's death. He added that those campaigning for people to complain to TV watchdog Ofcom should grow up . A campaign, called Report The Wright Stuff to Ofcom, has been launched by islanders on Facebook urging complaints to be made to television regulator. TV censor Ofcom has launched an investigation into a trivial joke made by presenter Matthew Wright about the police probe of a murder on Lewis. Ofcom, which has received about 2,220 complaints, confirmed the launch of an investigation into the programme. When the launch of a murder inquiry was reported in the newspapers last week, Wright put on a Scottish accent and said "there's been another murder", copying a phrase from detective show Taggart. Angus MacNeil, SNP MP for the Western Isles, raised a complaint with the watchdog saying making jokes about the tragedy ... is beyond belief . The Wright Stuff is a weekday morning topical magazine programme broadcast live on Channel 5. It is presented by Matthew Wright and includes a different panel of guests each day. Ofcom received 2,358 complaints regarding comments made by Matthew Wright and a guest during the daily newspaper review included in the programme on 6 December 2011, and Matthew Wright's subsequent apology on 7 December 2011. In summary, complainants considered Matthew Wright and the guest Charlie Baker made insensitive and inappropriate comments when discussing an article in the Daily Mail regarding the first murder case in the Hebrides for 40 years. CB: There's been the first murder, this is very sad, in the Hebrides on the Isle of Lewis [newspaper article is shown with photograph of the victim]. MW: [mock Scottish accent] There's been another murder . CB: Not another one, the first one for 40 years . MW: [mock Scottish accent] Well that's another one then, another murder . CB: The longest episode of Taggart of all time [MW laughing] there's lots of down-time in between . Now I know that some of you have been upset by some comments during yesterday's newspapers review about the murder of Liam Aitchison in Stornoway. I'd like to apologise if that was the case, certainly no intention on my part to belittle the seriousness or tragedy of the story, or to offend anyone who knew Liam. You know me - touched by death too many times in my life to belittle anything like that. Not helped though by people running campaigns - report Matthew Wright to Ofcom. I mean, grow up, folks ... I'm very sorry all the same. Understandably, I know many of you were upset by comments made in Tuesday's newspaper paper review with regard to the tragic murder of 16- year old Liam Aitchison in Stornoway. I would like to say again that I had absolutely no intention of causing any distress to anyone involved in this tragic event or to upset viewers. I deeply, deeply regret my thoughtless comments, and very sincerely apologise to Liam's family and his community. I truly apologise ok, from the bottom of my heart if I have made their suffering worse. I should add that Charlie Baker also wishes to apologise unreservedly, he's not here this morning and is genuinely sorry for the upset this has caused. Channel 5 said that it entirely accepted that the comments made by Matthew Wright and Charlie Baker on the programme were unfortunate, misjudged and entirely inappropriate . Ofcom noted that Matthew Wright's comments included a phrase ( There's been another murder ) commonly associated with the fictional Scottish detective Jim Taggart from the television series Taggart, and delivered in a mock Scottish accent. Ofcom also noted Charlie Baker's subsequent response The longest episode of Taggart of all time there's lots of down-time in between and his remarks regarding the quality of fishing in the Western Isles. Our view was that all these comments were clearly capable of causing offence to viewers given the sensitivity surrounding the very recent murder of a 16 year old teenager in an isolated Scottish community. Ofcom took account of the fact that The Wright Stuff is a live programme, and comments made by Matthew Wright and Charlie Baker during the news review were clearly unscripted and made spontaneously. Charlie Baker's remarks in particular were made in response to a comment by the presenter of the programme, which according to Channel 5 was unexpected to the production team and to Charlie Baker given the briefing exercise before the programme started. Notwithstanding this editorial context, Ofcom considered that the degree of offence that the comments caused was considerable. This was mainly because Matthew Wright responded to Charlie Baker's introduction to the news story by making a joke that made light of the murder. He then went on to laugh loudly with the audience as the conversation continued. In doing so, he appeared to pay no regard to the unfortunate circumstances of this murder case concerning the killing of a 16 year old well known to many within the local community in which he lived. The potential for offence was heightened because Matthew Wright made his joke while a photograph of the victim Liam Aitchison was being shown on-screen. We also observed that no apology was broadcast on 6 December in the programme itself. The absence of a timely apology was likely to have increased the degree of offence. Absent of any mitigation, the programme would have been in breach of the Code. However, Ofcom noted that: Channel 5 broadcast two apologies on 7 and 8 December 2011, and the presenter has apologised directly to Liam Aitchison's family; Channel 5 removed the 6 and 7 December programmes from its on demand service; and, Channel 5 has taken steps to improve compliance in response to this incident. Ofcom recognises that the comments caused considerable offence, particularly to viewers in Scotland. On balance, however, and in light of the steps taken by Channel 5 to mitigate this offence, Ofcom considered the matter resolved. Matthew Wright's Channel 5 show The Wright Stuff is being investigated by TV censor Ofcom over a survey that used the words mong , spaz and retard . Viewers were asked which of the three words was the most offensive term to describe someone with learning difficulties , according to a BBC poll. The daytime show was debating Rupert Murdoch's use of the word retarded with reference to David Cameron's son. 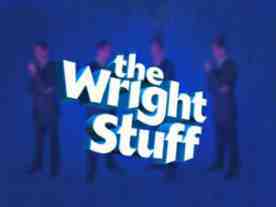 The 26 April edition of The Wright Stuff received about 10 complaints and Ofcom is considering whether the programme breached broadcasting rules relating to harm and offence.